Cost saving up-to 300% over other Device Clouds. Only Device Cloud to allow Rollover of Monthly Credits. Unlimited no. of parallel connections for Automation Run. Let us know the numbers of users and monthly usage of devices. We will customize the package only for you! We provide you with the Lab-in-a-box setup and give you the freedom to build your own secure device lab within your enterprise boundary. Ideal for you if you’re planning to build a centralized testing infrastructure for your team. Plan in subscription are auto-renewed based on whether you have chosen a Monthly or Yearly subscription. You can choose to stop the subscription at any time by canceling the plan. What is Device Hour and credit? Each plan is associated with certain no. of Device hours. 1 device hour is equivalent to 60 Credits. Each minute consumed is equivalent to 1 credit. You can access any no of devices until you consume all the credits. For example, If I use a device for 30 minutes my 30 credits will get deducted. This is unique to our subscription plan where your remaining credits from a month gets rolled over to the next month. Can I Upgrade, Downgrade or Cancel My Plan at any time? You can Upgrade, Downgrade or Cancel your plan at any time. Changes will reflect immediately. When you cancel or downgrade, you existing credits of the current plan will be lost. What payment method are we using? You should be able to use your credit/Debit card from any part of the world. We are using Stripe payment gateway. We don’t store your card information. 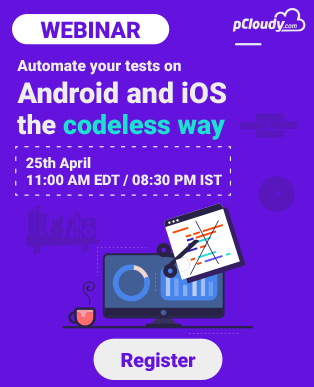 The features available in pCloudy’s cloud-based mobile testing platform has made a significant difference to mscripts testing strategy.The best part is the ease of integration of mobile test scripts with pCloudy’s platform – a few lines of code and you are all set! The reports generated are also very detailed for analysis. Overall, a great platform supported by excellent sales and support teams makes pCloudy a testing platform of choice in mscripts DevOps strategy.